A rich photography heritage has shaped the Samsung GALAXY S4 camera, with its 13-megapixel sensor, wide-open f/2.2 lens and all its smart shooting modes. 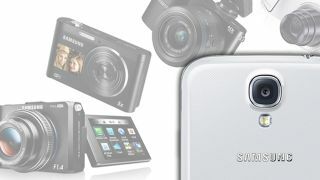 Samsung's compact camera range made front-facing screens and touch interfaces the norm. The high-spec NX range couples a DSLR APSC sensor with a smaller form factor and interchangeable lenses. For anyone looking for something in between, the mind-boggling Samsung EX2F is loaded with an astounding f/1.4 lens coupled with the form factor of a compact. With the Samsung GALAXY S4 camera being such a high-res, powerful picture taker, S4 owners tend to be the designated picture takers at a party. Sadly though, there's the age-old party snapshot issue: photographers are seldom in photographs and almost never in their own. Dual Shot is Samsung's solution to that problem. By simultaneously taking a picture with both the front and rear-facing cameras, the S4 takes a cool snapshot of the subject and the photographer at the same time. The result is a picture within a picture: perfect not only for get-togethers but also for a proud parent who wants to show off the situation from all angles, a pet owner cooing over his or her kitty, or any situation where there's more than one side to the story. Movement is incredibly difficult to capture in a photograph. Even if you're a professional using a manual camera, the results are often horribly blurred or unrealistically crisp. That's why Samsung has introduced Drama Shot: a whole new way of thinking about movement within a single still photograph. By taking multiple images and stitching them together, Drama Shot turns a photo into a study of movement, with a static background, and multiple images of the moving subject at various stages of its journey. The results are ideal for capturing dance, sports or active day-to-day situations and, best of all, it's completely automated, making it a piece of cake to use. Anyone who's surfed the web in the past year has probably encountered the craze for animated GIFs (if somehow you haven't, there's a whole load of them here). But did you know you can easily create GIFs on your Samsung GALAXY S4? How? Animated Photo, that's how. Just tap the Mode button in the bottom right hand corner of the S4's camera interface, then select Animated Photo. In the next screen, you can record a short clip. What makes Animated Photo more versatile than just any clip creating tool is that you can choose which portion of the screen to animate and which to keep eerily still. Once you've filmed your clip, simply rub your finger over the area you want to bring to life, and the remainder will stay static. The result is an eye-catching GIF file that plays motion against static photography with fascinating, funny or even freaky results. The interesting thing about phones with incredible cameras is that the photos you take on them tend to stay on them. Sure, some make their way to Facebook, and others to Dropbox. Some might even get printed out. But the vast majority remain on your phone, and now Samsung lets you take these photos further. Story Album is an auto desktop publishing app that curates your event photos, turning them into a smart photo album. With themes and a degree of manual control, you can easily find the perfect layout for your pictures, whether they were taken on holiday in the sun, at home with family, or at a wedding with friends. Once curated and collated, your Story Album can be enjoyed on-screen, or printed out as a beautiful, professional-quality photo book using Blurb's offline photo album service. If a picture is worth a thousand words, then a picture with sound must be worth twice as much! That might not have been the exact trail of thought going through Samsung's mind when it created Sound & Shot, but it works for us. How does Samsung's Sound & Shot work? By giving you the option to record nine seconds of audio either before you shoot or as soon as you take a picture. This means a photo of a London telephone box can convey the hustle and bustle of the city, a party picture can save that rousing chorus of happy birthday, and a concert shot can transport you back to the moment you took the photo with a burst of that encore that got you all dancing. You can even share your Sound & Shot photos with other GALAXY S4s, without the large file-sizes commonly associated with video. So there you have it: Dual Shot, capturing the scene from all angles; Drama Shot, documenting movement with ease; Animated Photo, creating moving pictures; Story Album, curating and collating your events into an album; and Sound & Shot, enriching your images with sound. While you're trying out these shooting modes, make sure you check out some of the other great camera features on the GALAXY S4, such as Rich Tone for high contrast scenes and Best Face for perfect group shots.